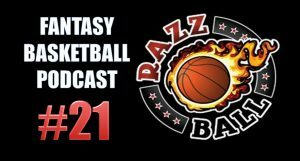 The Razzball Fantasy Basketball Podcast #21 – Injuries & Shake-Ups is up on YouTube for your viewing and listening pleasure. Craig and I go over the Dejounte Murray injury, the Suns firing their GM, the Warriors center battle, Lonzo and the Lakers, and I pick Craig’s brain about some of the surprise rookies of the preseason and if they should be owned in fantasy. Subscribe to the channel and click the notification bell to make sure you do not miss an update. Also, please leave your comments, questions, and likes on the video because all of that helps the channel to grow. We love talking fantasy hoops. We just wanted to say thank you to all the readers and supporters and will continue to work hard to bring you the best fantasy basketball content around. This channel is just another way to spread the word. Thoughts on this team? Made a few mistakes under pressure, feel like I got decent value on most of my picks but team just looks so…. blah… a bit unbalanced maybe? I like everyone but Dedmon and Aminu, but it’s a pretty balanced team. I’d look at some guys on waivers (or see who other people drop) to replace Aminu and reserve dedmon if your league allows it. Otherwise, sit tight if it’s roto and wait for a hot free agent. If it’s head-to-head then maybe pull the trigger earlier. What do you think? What area shall I improve? @RusG: Nice work getting LeVert so late, that’s gonna be huge for you. And I love turning Noel into a Swede. I really like the team. I think Gortat and Hill will end up being waived quickly for a hot free agent. But they should get minutes early on. Nice work and thanks for the support!